Readers love it when subjects political pop up on The War Eagle Reader—it’s their favorite thing, almost like it’s the only thing they want to read (even though we never pick sides like everyone seems to want us to and focus only on how whatever it is relates to Auburn). So what better time to give them what they want (to hate) than election season! 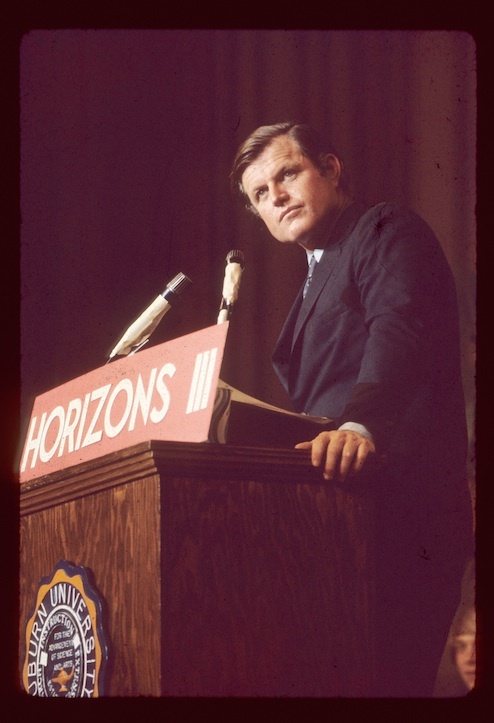 First up: Teddy Kennedy (D-Mass.) 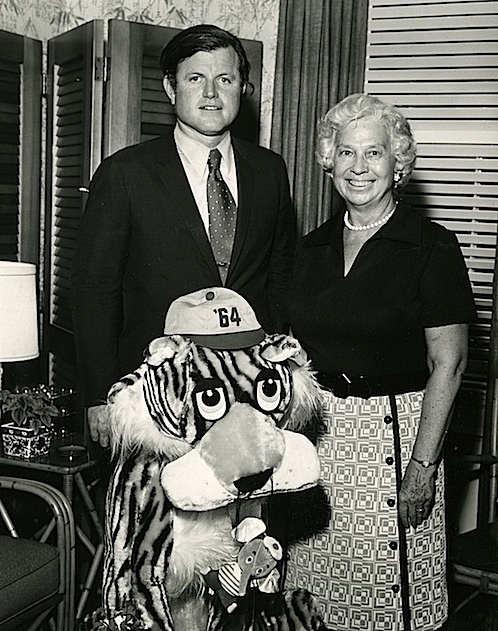 and Auburn Dean of Women Katharine Cater posing with a giant stuffed Tiger dangling an elephant (Bama? Republican?) from its mouth by a rope, a fantastic photo op which, despite the ’64 rat cap, most likely came about during Kennedy’s Horizon III speaking engagement at Auburn in 1973. Kennedy’s is the blank just-take-it face of celebrity obligation. But a staunch Democrat, Kitty’s smile—and you rarely see it that wide—is most definitely sincere. Here’s a shot of Teddy at the podium. Keep your polls open for more past bi-partisan politicking on the Plains (TM) in the coming days and weeks. Top photo: AU Archives. Bottom photo by Larry Parker. Related: Ronald Reagan was an Auburn fan. As long as he had a driver, I’m sure everything went well. That was a weird night. I shared an office in the coliseum and was locked out of it from 2 in the afternoon. Secret Service or CIA or whomever, swept the building and put tape on all the doors to prove that they were all secure. During the speech there were a couple of dozen guys in suits continually talking into there hands. Found out later that there were snipers both on the outside and the inside during the speech. Supposedly there were 2 motorcades (one a dummy) from the Auburn airport. Don’t remember a thing about the speech. Place was about 1/3 full if I recall.